Portugal. The Man + Drizzy for the win. With warm pastels and muted tones, the visuals zero in on Sydney picking up people from all walks of life–a grumpy business man, a woman in labor, and a man who turns the backseat into a changing room. When she’s not chauffeuring these individuals around, the vid cuts to images of her eating frozen dinners alone in her apartment, looking dismal as a party of one. That is, until she meets her soulmate passenger, making us wonder, "Is Uber the new Tinder?" The single, and the rest of the tracks off of Echosmith's latest EP, marks a shift into new, dreamier territory for the trio. The album's seven songs show off a more dynamic sound with shiny synths, airy guitars, and sweet vocals. 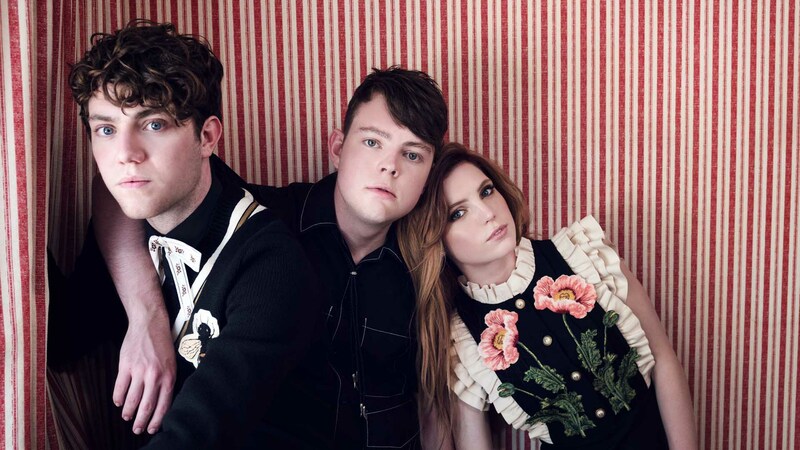 Sydney, Graham, and Noah Sierota may have been teenagers when their 2013 singles “Cool Kids” and "Bright" shot them to superstardom, but after touring with Taylor Swift, recording their new album, and re-adjusting their lineup, Echosmith and their music have matured across the board. “We were so blessed for "Cool Kids" to blow up and see the world. We got to realize the depth of spreading love, how important it actually is, and the lack of love in the world. Our message has stayed the same, but we understand it more. We go deeper. Life is hard, but you can find the joy no matter what. That’s what we’re here to show people,” explained frontwoman Sydney. We loved “Get Into My Car” and its transit-themed video so much, so had to find out what Echosmith like to listen to in their whip IRL. We caught up with the California trio to get a taste of what blares through their speakers, which ranges from Weezer to Frank Ocean to Vancy Joy. Check it out below, then make sure to Track them on Bandsintown to catch the three-piece when they're in your city next spring! "We’ve done some shows with Vance and we love what he does. Great writing! " "This guys voice is just so amazing." "What else would we have playing in our car? ;)"
"This is a really great song that still sounds like it was done by a band. " "Seems like Drake can not write a bad song. ❤️ everything about it." "Song feels perfect and love franks voice!" "Niall has really found his vibe and this is just a great song by a great singer playing real music." “This song wakes us up and makes us few hyper and ready for our day. Jack is a crazy talented artist and writer. " "This song is perfectly produced." “This song has been on many of our Spotify lists because we just can’t get it out of our heads."